A great deal of words, tears & possibly blood has been spilled over which makes a better grill- charcoal or gas? Both have their advantages and disadvantages, and with today’s accessories and techniques, both can get the job done! Professional pit masters rave about charcoal grills, but actually 68% of American grill owners use gas grills. It all comes down to which grill is right for you. Extra Work, Extra Flavor- We’ve all heard how much extra work a charcoal grill can be- harder to clean, longer to start up, etc… but the extra flavor is well worth it. You just can’t get that special, smoky flavor on a gas grill. The Healthier Option- Natural lump charcoal carries more flavor while eliminating the harmful effects of lighter fluid & brickquettes. Good bye chemicals & gas fumes! Plus, who doesn’t love playing with real fire! Instant Heat- If you’re hungry when you get home, you don’t have to worry about a 30 minute delay. Gas grills made dinner quick! 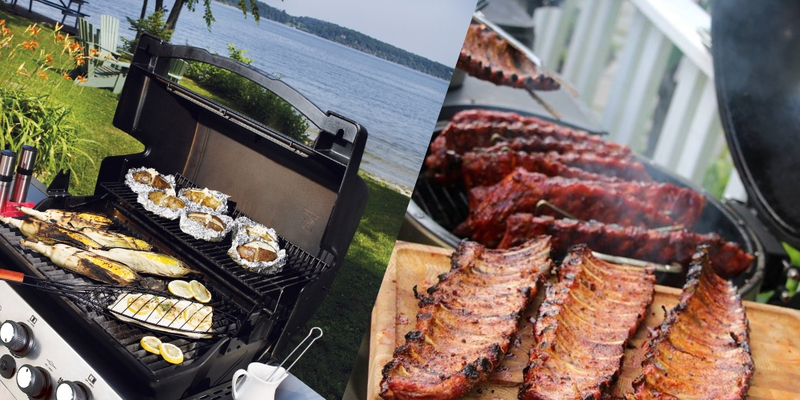 Quick, Easy & Efficient- Gas grills can be made the perfect temperature by the turn of a knob. You won’t ever have to worry if your temperature is too high or too low. Wood Chips- Wood chips can add an extra, unique flavor to your food. We carry multiple flavors of wood chips, including apple, cherry, whiskey, hickory & mesquite. Still have questions? Visit our showroom in Kimberling City! Our grill experts are happy to assist you & answer all of your grilling questions. Let’s find the grill perfect for you!